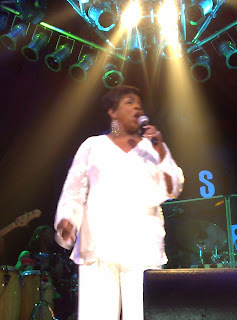 Judy Rodman - All Things Vocal Blog: Why is Gladys Knight So Good? I just got back from singing background vocals for the Jim Wilkes Show at the House Of Blues in Las Vegas. Our performance went very well...Jim truly rocked the house...and the all star band from Nashville (with horns!) was fabulous. We then had the extreme pleasure of watching our headliner...one of the best vocal artists out there… Gladys Knight! Gladys Knight raises the bar for all singers. She gave fresh meaning to having the audience in the palm of her hand. She was friendly and generous… giving thanks to not only her amazing band, but also honored my friend, producer/pianist Ron Oates, who was there in the audience. Ron had arranged and produced Gladys on the song “Wind Beneath My Wings” which didn’t get released due to some label politics at the time, but which remains in my opinion the best version ever created on this song. We got a bonus…she had her brother (who happens to be the head of her old bgv group “The Pips”) step in for a spot in the middle of the show. He had everybody roaring and appreciating his still-smooth choreography and showmanship. She knows exactly what kind of vocal lick to use to make the right emotional point when the song calls for it. She also know when NOT to do anything other than sing the simple melody, and when it's more emotionally powerful to end the song on an easy middle note instead of some grand diva vocalise. She knows how to use her whole body’s posture - getting taller and pulling back for the most difficult notes. She knows how to masterfully use her microphone- squeezing and pulling the mic like it’s a structural part of her voice. She knows how to use her face- how much to free her jaw, what shape to open her mouth and how actively to use her beautiful eyes to create different vocal tones, creating a kaleidoscope of vocal colors to use in her musical language. She very effectively surrounded her signature ballads with crowd- hypnotizing r&b groove songs (Heard It Through The Grapevine juxtaposed with Killing Me Softly”. I thought it might be a mellow show… oh no. The energy had us all on our toes, and then her ballads were set apart like pictures in picture frames. As I said earlier, she is generous with credit, honoring others who helped her along the way, but she is also generous with the audience. She made us all feel like she was singing especially to and for every one of us. She was present with us... and never gave the slightest impression that she was bored with a song or with having to do a show. I have a feeling she limits the number of shows she does so that every show stays fresh- a true event - for her as well as her audience. Gladys Knight… one of the masters of our craft of singing. If you ever get the chance to see her… jump to it!